You are tired of waking up at night in a fear that an amount of your luggage to the next trip is really ENORMOUS? If it is true, this article has been created for you. So, sit down, relax and read it carefully. Not many travelers have heard about folding or collapsible coolers. For the first view this type of coolers seems like unreal and stupid. When we think about coolers in our imagination a huge, heavy ice-chest cooler with durable body, handles and wheels occurs. Even thought about its folding seems ridiculous. But…it is true and they really exist! The main thing in each trip whether it is short or it takes you several days is convenience. If you are permanently tired of carrying heavy and inconvenient luggage of course your trip will be spoiled together with your mood. To prevent such scenario our team has prepared a list of the best folding and collapsible coolers for those who really appreciate convenience. It may sounds strange but the world of best-performing coolers doesn’t consist of only large, heavy and cumbersome coolers. In this article we will show you the best representatives of collapsible and folding coolers that will not take a lot of space in your luggage. Not in every situation you need to take a huge and expensive high-end ice chest to your trip. Sometimes all you need is not very big, convenient cooler in which you can put some bottles of drinks, couple of sandwiches and go to the beach or somewhere else. 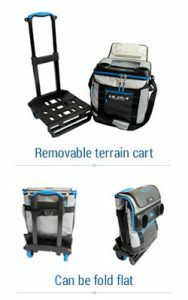 In this post you will familiarize with the best variants which help you to choose the best collapsible ice chest, folding cooler, pop up cooler and collapsible cooler bag. These coolers will not provide you with several days of ice retention but if you need your cooler to keep an ice during some hours when you are outdoors these variants will interest you. TOP 5 Best Folding and Collapsible Coolers For You. Coleman brand is known all over the world and its quality doesn’t need any advertising. There are various types of coolers from this manufacturer that have already placed the TOP places in many lists of highest quality coolers. So, it is no wonder that the first place in our chart is occupied by the representative of this world famous manufacturer. This soft 40-can collapsible cooler has occupied the fist position because of its convenience and highest quality of characteristics. With the size equal to 14” x 11.4” x 12.3” the capacity of this Coleman cooler is 40 cans as it’s clear from its name. For such size the spaciousness of this cooler is really great! And the most important characteristic of this Coleman cooler is its folding ability. 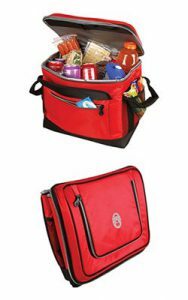 You can easily fold this cooler and put it in any of your bags without any worries that there will not be enough room for it. When folded up this cooler takes place as small flat notebook that makes it the best variant for your trips. One more feature that make this cooler a winner in our list of 5 best folding coolers is its material. 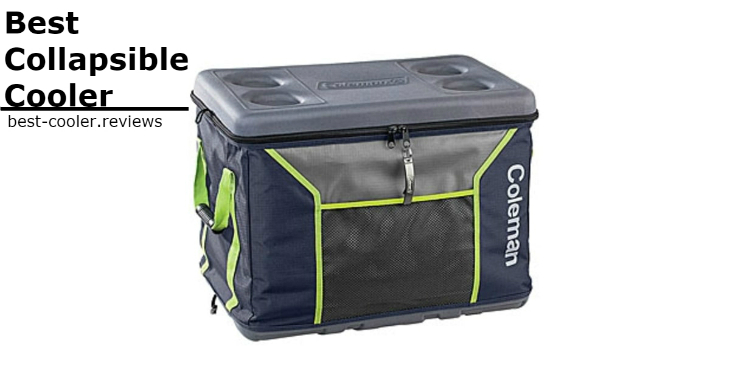 Coleman cooler is made of heavy-duty 420D nylon that is durable and easily cleaned. The duration of the ice retention period of this cooler is typical for collapsible and folding coolers. It is able to hold an ice inside up to three hours. For those who love bright colors this model is also available in Red, Navy and Grey variants. This cooler is another representative of the best folding coolers. In comparison with the previous model this cooler can hold an ice from 5 to 6 hours and will not leak when the ice melts. 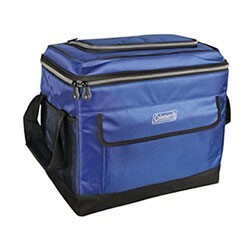 The material of this cooler is also better than the Coleman cooler, this one is made of 600D ripstop polyester. But together with advantages this cooler has disadvantages too. 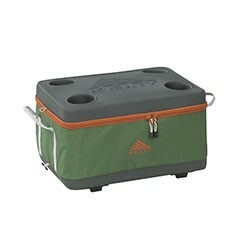 Because of more tough bottom and top this cooler is more bulky and more inconvenient comparably with the Coleman. This cooler’s lid is equipped with special holders for your cans that is very convenient but also add some weight to your cooler. With all its advantages and disadvantages this cooler is the great variant for camping or picnicking with your friends. All its features make this cooler durable and portable at the same time. 1) small size – 18 QT / 17 Liters. Small variant of Kelty cooler has sizes of 16.5″ x 9.5″ x 12.5″. The capacity of this cooler is 20 cans with room for ice and its weight is1.5kg. 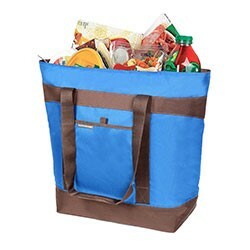 2) large size – 38 QT / 27 Liters. Large variant of Kelty cooler has sizes of 19.3″ x 10.5″ x 14″. The capacity of this cooler is 36 cans with room for ice and its weight is 1.9kg. You can pick up the most appropriate cooler size for your trip and don’t be afraid of its weight because both these variants are light and very convenient. This cooler is one and only cooler in our list that has WHEELS. It seems that collapsible cooler with wheels is nonsense but we will prove you the opposite. Arctic Zone cooler that is available right here proudly occupies the third place in our chart. This cooler has all features that are necessary for convenient trip. It is equipped with outer pockets, durable strap for easy transporting and holders for the cans with your favorite beverages. And of course its rolling cart with wheels will provide you easy transportation of your cooler even on the rough terrains. One disadvantage of this cart is that you will face with some inconveniences when rolling it over the sand. In such case you will make a lot of unnecessary efforts. 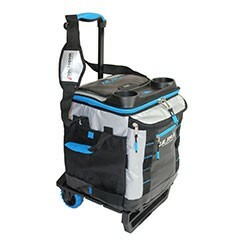 But for such situations manufacturers have made this cart fully detachable, and in some cases it will be more convenient for you to carry this cooler as a backpack. Size of Arctic Zone cooler is 15.5” x 14” x 14.25”, while its capacity is 58 cans. Beside modern and very stylish look this circular 24-can pop-up cooler has really excellent features. 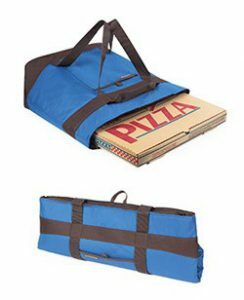 The measures of this cooler are 13.5” x 3”, that make it the most collapsible, small and convenient variant in our list. In the unfolded form this cooler has measures of 13.5” x 9” that will be more than enough to take it to your next picnic or beach party. One more small but so important feature of this cooler is the presence of corkscrew. Agree that it is a brilliant idea because there are always situations when we forget to take a corkscrew to the picnic and try to open bottle of wine in all possible ways. The ice retention period of this cooler is not so long as in our previous variants but thanks to qualitative PEVA interior lining you will not notice any leaks through your cooler when ice starts melt. We recommend you to go to Amazon and choose your favourite one. 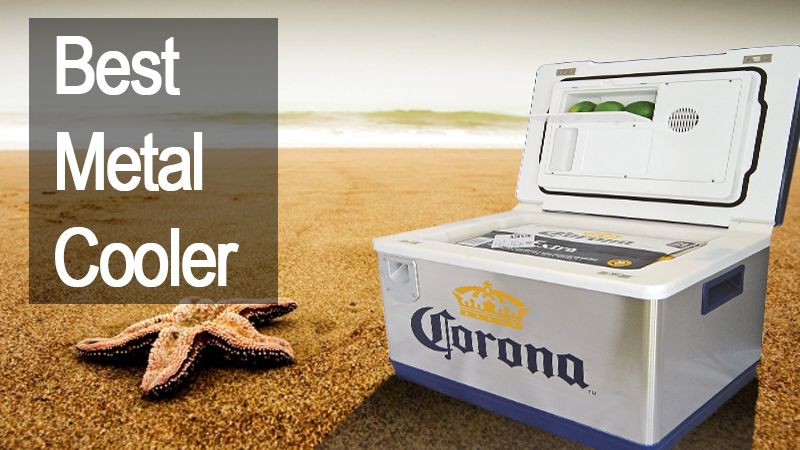 This cooler is the last representative of best folding and collapsible coolers in our list. We have found lots of positives reviews from users about this model. Let’s consider what its features have deserved so many ovations. 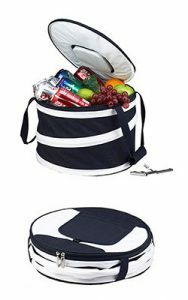 This variant of insulated collapsible cooler bag is multifunctional. You can take it everywhere starting from the nearest shop to the weekends beach party. With the price about $30 this soft sided cooler will be the fantastic value buy, or an awesome gift idea. As all coolers in this list this one can be easily folded and will not take much space in your bag. 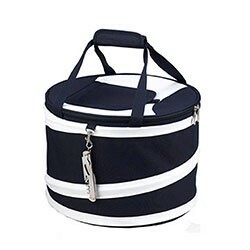 The size of this cooler is equal to 22” x 8” x 17.2”, and it means that you will be able to take many sandwiches and drinks to your picnic or fill it up with all necessary goods from the shop. Among the main features that are the pride of this cooler are high quality 600D polyester exterior, special ‘Therma-Flect’ radiant barrier that allow to carry not only cold goods but hot as well and high level of insulation thanks to the special foam. In the users reviews we have read that many people simple put this cooler to their cars in order to use it in the case of need and they claim that such cases occur really often. As we stated from the get-go, the aforementioned folding and collapsible coolers are certainly not the best-performing coolers on the market. 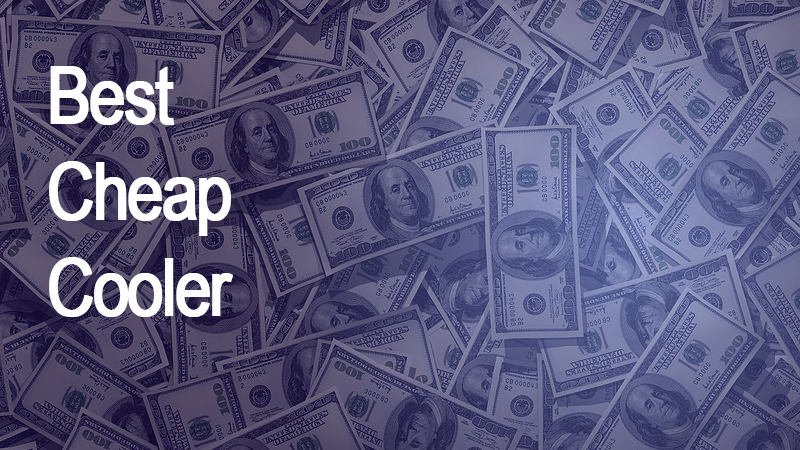 In all reality, you’re making a sacrifice for convenience over performance. In conclusion we want to say that folding and collapsible coolers are the most convenient variant to take to the picnic or the beach party but their characteristics are far from the best. If you need a cooler for couple of hours, don’t want to worry about its carrying and all you need is convenience than each of these variants suits you. But if you are going to several days trip and want rather long duration of ice retention period it will be better for you to consider other coolers. In such case you should choose among convenience and the highest quality of coolers’ characteristics that include long ice retention and effectiveness. In the case if you want to consider deeply some of the previous variants check all folding coolers currently listed on Amazon.